Microsoft from GeekWire Cloud Tech Summit: New Azure innovations will advance the intelligent cloud and intelligent edge - Mark Russinovich CTO, Microsoft Azure, covers announcements he made at the GeekWire Cloud Tech Summit. He also discussed how customers are using the cloud and what the future holds with GeekWire’s Todd Bishop and Tom Krazit. This post provides a roll-up of the announcements made at the summit, which are covered in more details in the posts below. Azure simplifies cloud analytics - This post provides a roll-up of the big data analytics news, including the preview release of Azure Data Lake Storage Gen2, which unifies the core capabilities from the first generation of Azure Data Lake with a Hadoop compatible file system endpoint now directly integrated into Azure Blob Storage. This enhancement combines the scale and cost benefits of object storage with the reliability and performance typically associated only with on-premises file systems. Azure Friday | Episode 446 - Azure Data Lake Storage Gen2 overview - James Baker joins Lara Rubbelke to introduce Azure Data Lake Storage Gen2, which is redefining cloud storage for big data analytics due to multi-modal (object store and file system) access and combining the best qualities of a dedicated analytics file system with those of a cloud-scale object store. Azure Data Factory new capabilities are now generally available - With a drag-and-drop graphical user interface, data engineers and developers can quickly and easily create, schedule, and manage data integration at scale. Azure Data Factory now supports code-free data ingestion from over 70 data source connectors to accelerate data movement across on-premises, cloud, and applications. Lift SQL Server Integration Services packages to Azure with Azure Data Factory - Using code-free ADF UI/app, data engineers and developers can now provision and monitor Azure-SSIS Integration Runtime (IR) which are dedicated ADF servers for SSIS package executions. Data engineers and developers can continue to use familiar SQL Server Data Tools (SSDT) and SQL Server Management Studio (SSMS) to design, deploy, configure, execute, and monitor SSIS packages in the cloud. All of these capabilities are now generally available. Enterprises get deeper insights with Hadoop and Spark updates on Azure HDInsight - Azure HDInsight is one of the most popular services amongst enterprise for open source Hadoop & Spark analytics on Azure. This post covers updates to Apache Hadoop, Apache Spark 2.3, Apache Kafka 1.0 and 2000 plus bug fixes across 20 plus Open Source frameworks that are part of HDInsight, the general availability of Machine Learning (ML) Services 9.3 on Azure HDInsight, enhancements to HDInsight to include support for Virtual Network Service Endpoints, improved security and compliance, and a 50% reduction in HDInsight pricing. Azure IoT Edge generally available for enterprise-grade, scaled deployments - Azure IoT Edge is now generally available (GA) globally. This post goes into detail on updates for developing and deploying intelligent applications to Azure IoT Edge, including the release to open source of the IoT Edge runtime. In addition, you can learn what a few of our customers and partners have to say about IoT Edge. The IoT Show | Azure IoT Edge - ready for enterprise-grade, scaled deployment - Azure IoT Edge is now generally available and ready for production. The release comes with new features making the platform enterprise ready such as 0-touch provisioning and CI-CD support through VSTS. Check out the 0-touch provisioning demo in this new episode of the IoT Show. Automatic device management, module identity, and module twin are now generally available - Each of these features enable scenarios to enhance device management capabilities within your IoT application built on Azure IoT Hub. Learn more about these features and the expanded SDK support they each bring. Expanding Azure Certified for IoT program for the intelligent edge - With the emergence of the intelligent edge and hardware innovations, we are expanding the certification program to support a wide range of hardware from low powered, constrained devices to AI-capable industrial gateways. This post announces certification of Azure IoT Edge devices in the Azure Certified for IoT program, supporting certification of core functionalities such as device management, security, and advanced analytics. Learn more about the certification program, including device prerequisites and certification criteria. We’ve announced 54 Azure regions to help you deliver cloud services and apps to nearly every corner of the globe and to provide everything that’s needed to run mission-critical applications, across scenarios, with a full set of resiliency solutions. Two additional regions are now generally available in China. In addition, we recently announced plans to expand our cloud infrastructure in Europe and the Middle East, including plans for new regions coming to Norway. New zone-redundant VPN and ExpressRoute gateways now in public preview - By adding support for Azure Availability Zones, we bring increased resiliency, scalability, and higher availability to virtual network gateways. You can now deploy VPN and ExpressRoute gateways in Azure Availability Zones, which physically and logically separates them into different Availability Zones protecting your on-premises network connectivity to Azure from zone-level failures. Additionally, we have made fundamental performance improvements including reducing the deployment time to create a virtual network gateway. Azure Elastic Database jobs is now in public preview - The Elastic Database jobs is part of Azure SQL Database service and there is no additional charge for using the public preview version. 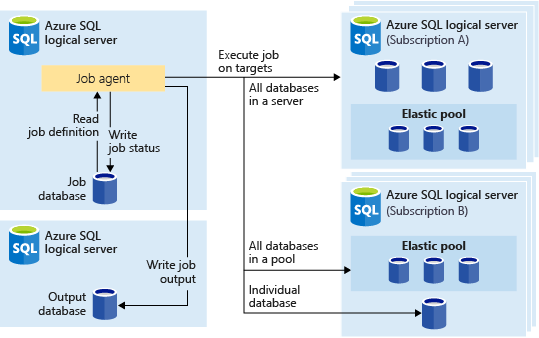 Unlike the earlier, customer-hosted and managed version of Elastic Database jobs, this version is an integral part of Azure with no additional services or components to install and configure. This release also adds significant capabilities making it easy for customers to automate and execute T-SQL jobs using PowerShell, REST, or T-SQL APIs against a group of databases. These jobs can be used to handle a wide variety of tasks such as index rebuilding, schema updates, collection of query results for analytics, and performance monitoring. Autocomplete in Azure Search now in public preview - Autocomplete (one of our most requested features), also called “type-ahead search”, can enhance the search experience by finding potential terms in the index that match the partial term being written by the user. Autocomplete API also supports fuzzy matching in each of these modes. When fuzzy is enabled, it compensates for typos and misspellings, and proposes relevant results based on user intent. Network Performance Monitor’s Service Connectivity Monitor is now generally available - With Service Connectivity Monitor (previously in preview as Service Endpoint Monitor), you can now monitor connectivity to services such as applications, URIs, VMs, and network devices, as well as determine what infrastructure is in the path and where network bottlenecks are occurring. 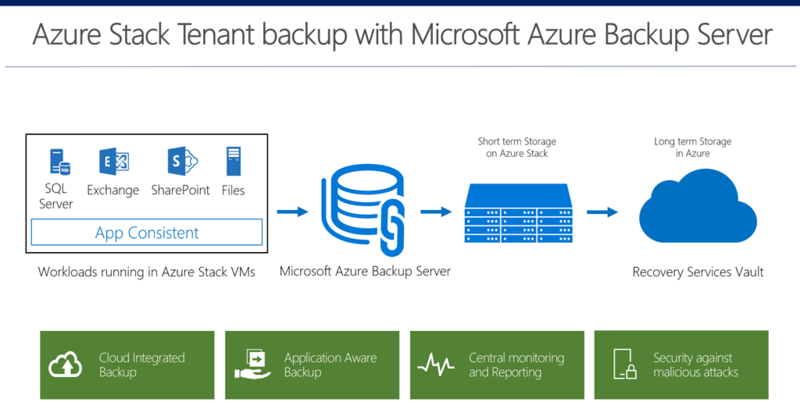 Backup your applications on Azure Stack with Azure Backup - Announces the capability to backup files and applications data using Microsoft Azure Backup Server. Azure Stack tenants can now take app consistent backup of their data in Azure Stack VMs, store them on the stack for operational recoveries, and send the data to Azure for long-term retention and offsite copy needs. Use Azure Active Directory with Spring Security 5.0 for OAuth 2.0 - Spring Starter for Azure Active Directory (AD) is now integrated with Spring Security 5.0. It offers you an easy way to build OAuth2.0 authentication and authorization flow for your Java apps in the cloud, supporting both implicit and authorization code grant types. With only a few lines of configuration, you can build apps that perform authentication with Azure Active Directory OAuth2 and manage authorization with Azure Active Directory groups. 4 month retirement notice: Access Control Service - As originally announced in November, 2017, this is a reminder that the Access Control Service, otherwise known as ACS, is officially being retired. ACS will remain available for existing customers until November 7, 2018. After this date, ACS will be shut down, causing all requests to the service to fail. The Azure Podcast: Episode 235 - AI, Blockchain and Big Data discussion - Cale and Sujit talk about the new style of applications that leverage AI, Blockchain and Big Data services in Azure. Healthcare on 5G - As healthcare plans IT for next 3-5 years it is important to take 5G into consideration as it opens new opportunities to move workloads to the cloud both for the use cases discussed in this blog, and many more. 5G has a latency of less than 1ms, bandwidth of up to 10 Gbps, and up to a million connections per square KM! This is going to pave the way for many new innovations in healthcare, which are discussed in this post. Augmented Reality becomes mainstream in Manufacturing, changes the face of the industry - Learn how the real value of AR/MR is in augmenting the real world with digital information, and not just projecting 3D models in physical space. In other words, providing additional context around the thing you were looking at. That’s when AR/MR “clicked” and more innovative and useful applications started to emerge, now attracting the attention of even the most skeptical and crusty manufacturers. How tech is moving the insurance industry to be more customer-focused - Learn how the insurance industry is using the AI and IoT to be more customer-focused. With the increased use of IoT data to track changes in risk, it gives insurers the opportunity to be more valuable to their customers. The use of AI at all levels of the insurance value chain will ensure customers are correctly matched with the right insurance products, and made aware of any gaps in coverage in real-time. Reasons why retail and consumer goods brands should address Artificial Intelligence today - Learn how technology can now deliver innovative solutions directly to insurance customers. For example, chat bots, driven by AI, direct customers to the most appropriate products and price the products based on the most current risk assessment. The customer interaction continues afterwards, IoT and telemetric data are used to adjust risk then alert customers of claim-generating events. Azure Friday | Episode 447 - Azure AD Managed Service Identity - Arturo Lucatero joins Donovan Brown to discuss Azure AD Managed Service Identity, which can be used to authenticate to any service that supports Azure AD authentication. Azure Friday | Episode 445 - Managing costs with the Azure Budgets API and Action Groups - Vinod Kurpad joins Lara Rubbelke to discuss how Azure Cost Management APIs provide critical cost management features like budgets and data APIs to enable granular analysis of your cloud spending. Structured streaming with Azure Databricks into Power BI & Cosmos DB - This post discusses the concept of Structured Streaming and how a data ingestion path can be built using Azure Databricks to enable the streaming of data in near-real-time. It touches on some of the analysis capabilities which can be called from directly within Databricks utilising the Text Analytics API and also discuss how Databricks can be connected directly into Power BI for further analysis and reporting. As a final step, it covers how streamed data can be sent from Databricks to Azure Cosmos DB as the persistent storage. A closer look at Azure Data Lake Storage Gen2 - Azure Data Lake Storage Gen2 takes core capabilities from Azure Data Lake Storage Gen1 such as a Hadoop compatible file system, Azure Active Directory and POSIX based ACLs and integrates them into Azure Blob Storage. This combination enables best in class analytics performance along with Blob Storage’s tiering and data lifecycle management capabilities and the fundamental availability, security and durability capabilities of Azure Storage. This post takes a closer look at the innovative Hadoop file system implementation, Azure Blob Storage integration and a quick review of why Azure Data Lake Storage Gen2 enables the lowest total cost of ownership in the cloud. Using the Retry pattern to make your cloud application more resilient - Running your application in containers or in the cloud does not automatically make your application resilient. It’s up to you to configure the features that will enable the retry logic you provide. This post takes a look at how you can make your system more resilient by applying the Retry and Circuit Breaker resiliency pattern. The emerging big data architectural pattern - Lambda architecture is a popular pattern in building Big Data pipelines. It is designed to handle massive quantities of data by taking advantage of both a batch layer and a stream-processing layer. This post looks at some of the reasons that have led to the popularity and success of the lambda architecture, particularly in big data processing pipelines. Migrating IoT Edge solutions to GA - The release of IoT Edge to GA adds many new features for those already using public preview bits. Customers who have never used Azure IoT Edge can start with the Linux or Windows quickstarts. Those who have started projects on preview bits should upgrade to the latest bits and integrate breaking changes. This post helps current customers update their projects to work with the GA release of IoT Edge. Azure This Week - 29 June 2018 - In this episode of Azure This Week, Dean takes a look at the public preview of Azure Elastic Database Jobs, Event Triggers for Azure Data Factory, as well as a number of services that have been updated to support Availability Zones. Silicon development on Microsoft Azure - Microsoft is both a developer and consumer of silicon. We are partnering with our internal silicon development organizations as well as the industry – design, manufacturing, and tools – to addressing current and emerging infrastructure needs with the silicon design and development workflow that is based on electronic design automation (EDA) software. Last week at the Design Automation Conference (DAC), we released a white paper with detailed information on how to configure Azure services for Silicon development, Azure for the Semiconductor Industry. Customer 360 Powered by Zero2Hero now available on Azure Marketplace - Bardess is bringing together the technology of Cloudera, Qlik, and Trifacta, along with their own accelerators and industry expertise, to deliver rapid value to customers. Customer 360 Powered by Zero2Hero, is the first in a new series of integrated solutions coming to Azure Marketplace and AppSource as Consulting Services offers, and is now available. Azure Friday | Episode 444 - Using JFrog Artifactory with Azure Kubernetes Service - Kit Merker, VP of Business Development at JFrog shows how you can easily build and release software using popular DevOps tools including Git, Jenkins, Artifactory, and Azure Kubernetes Service (AKS). Get video insights in (even) more languages! - Video Indexer is a cloud application and platform built upon media AI technologies to make it easier to extract insights from video and audio files. Supported languages include English, Spanish, French, German, Italian, Chinese (Simplified), Portuguese (Brazilian), Japanese, Arabic, and Russian. We partner with other transcription service providers to extend Video Indexer's speech-to-text capabilities to many more languages. One of those partnerships is with Zoom Media, which extended the Speech-to-text to Dutch, Danish, Norwegian and Swedish. An open-sourced release of an integration between Video Indexer and Zoom Media now available on GitHub.